One thing that changes a nice afternoon on a boat to a great afternoon is music. With summer coming upon us quickly, it is time to equip your boat with the biggest and best audio sound system so that you and your friends can rock the water. When it comes to wakeboard speakers, there are many components that contribute to a great sound, but determining the right ones for you can be difficult because everyone has different opinions. To save you time and research, the following sound systems have been recommended as some of the top products available this season. Choose one or all for high quality sound. To get started, you need a good head unit. Infinity’s PRV 250 has AM/FM radio, AUX and USB inputs for audio device connection, and Bluetooth technology so that you can stream your audio. It is able to withstand moisture, salt, and sun, and the interface is watertight. For a complete sound system, it also has outputs to connect to an amplifier, power speakers, or a subwoofer. Tower speakers are a great addition to any marine sound system. These are of high quality and are resistant against water, fog, salt, and UV Rays. They contain LED bulbs to light up your boat at nighttime and the 2-way speakers have 150 watts of power. Some highly recommended in-boat speakers are from Kicker, and in addition to distributing great sound they also light up. 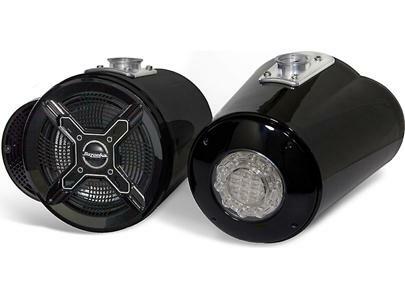 These are 2-way speakers that deliver 130 watts of power and have a high frequency range. They are ready for the water, with sealed structures and sun resistant woofer cones. Most boaters are highly impressed with the multicolor LED lights that can be changed with a remote control. For a serious sound system, subwoofers take your music projection to a totally different level. With the same LED lighting as the Kicker speakers, these 10 inch subwoofers deliver 150 watts of power. You can choose from the single 2-ohm or 4-ohm models, and they both come with a protecting grille that helps to drain the moisture that collects from being out on the water. Other weather proof features include UV treatment. If you want a lot of power with your sound system, amplifiers are the way to go. The Wet Series from MTX are made for marine activities, with surface mount technology, stainless steel fixtures, a coated circuit board, and control-adjustments that are protected by a plastic splash guard. There are a number of models to choose from, including the 2-channel 200 watt RMS, the 4-channel 400 watt RMS, and the 500 watt RMS monoblock.